The MagAlpha MA750 is a robust, contactless, angle encoder suitable for control buttons and knobs. The IC detects the absolute angular position of a permanent magnet, typically a diametrically magnetized cylinder attached to the rotor. The output is digital (SPI) or pulse-width modulation (PWM). 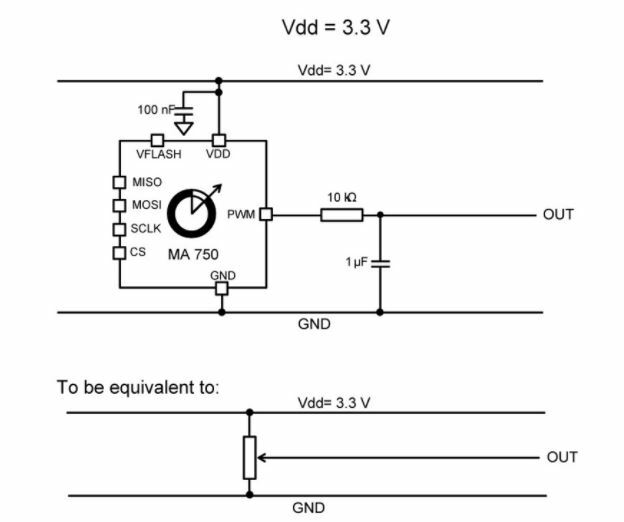 For usual potentiometer replacement, the PWM signal can be filtered to obtain an analog signal.